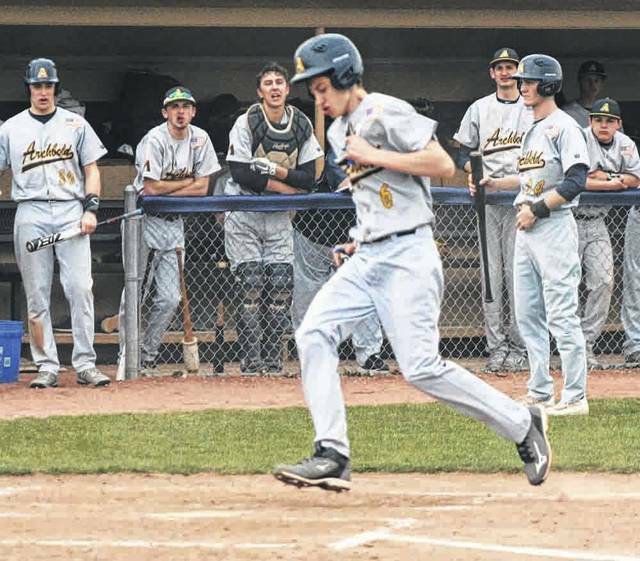 Archbold’s Jeron Williams trots home for a run during a baseball game last spring. Williams is back for his senior season. 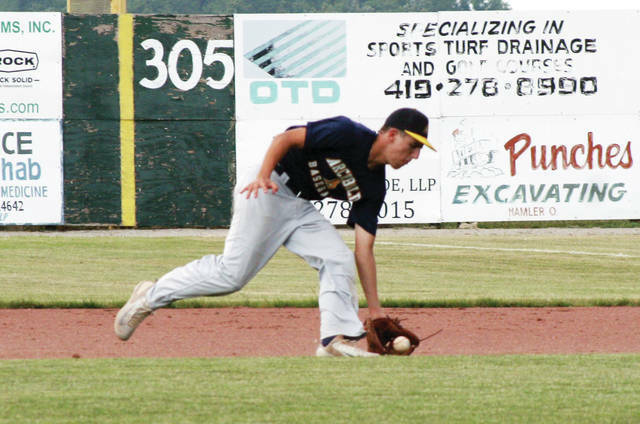 T.J. Rice of Archbold fields a ball in an ACME baseball game last year. He is one of nine returning letter winners for the Blue Streaks in 2019. Despite losing six all-league performers from 2018, Archbold appears primed for another successful season led by two Division I athletes. Junior Kade Kern leads nine returnees for the Blue Streaks, who have won three straight district championships and finished second in the NWOAL last season. Kern, an Ohio State commit, hit .402 last season with 36 runs batted in and was first team all-league. He will man centerfield. Rigo Ramos, a Bowling Green signee, is back for his senior season after being named second team all-league. The pitcher and first baseman was 4-1 on the hill with a 3.27 ERA last season. Senior shortstop Jeron Williams returns after being named honorable mention all-league and hitting .330 with 31 RBIs in 2018. Senior TJ Rice (P/3B) hit .385 last year with 14 RBIs and was also 3-2 on the mound with a 3.23 ERA. Senior Corey Erbskorn (OF), a Trine signee, is back after hitting .279 last year. Other returnees are senior Mitch Grosjean (OF) who hit .320 last year, senior Holden Galvan who hit .250 with 13 RBIs, senior Aiden Warncke who was 3-0 with a 1.47 ERA, and catcher Travis Ziegler. Good overall balance between pitching, hitting, and defense was listed a strength by Selgo. Even with all the returning talent, Archbold did lose several key players from last year’s 24-6 team. Gone are first team all-leaguers Brandon Miller and Bryce Miller; all-league second teamer Gabe Petersen; and Nic Rodriguez, Bryson Taylor, and Trevor Rupp, who were each honorable mention all-league. Promising newcomers for 2019 include senior Clay Nafziger (IF), senior Kreighton Sims (P/1B) and junior Drake Mohring (1B). The NWOAL should be tough as always.